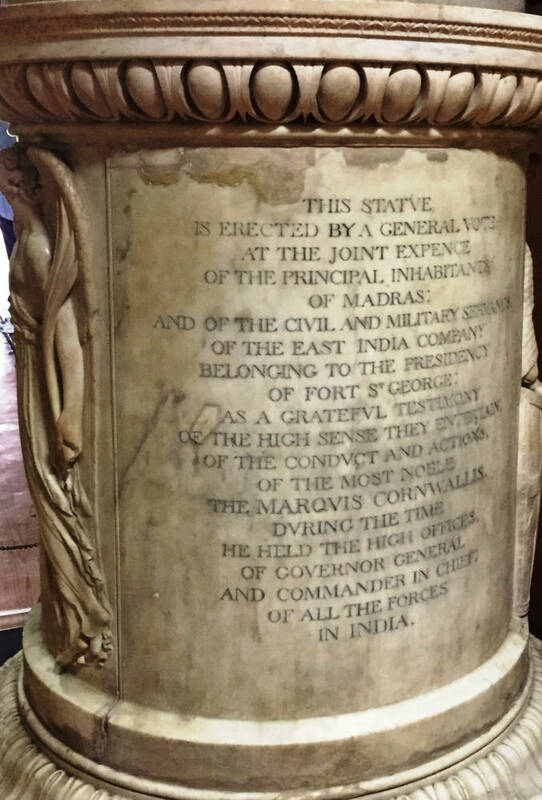 The marble portrait statue of Cornwallis was the first publicly erected monument exported to India from Britain. In celebration of his successful treaty with Tipu Sultan the citizens of Madras met at the town hall on 21st May 1792 and voted to commission a statue. The only sculptor to produce a model for the competition was Thomas Banks RA. 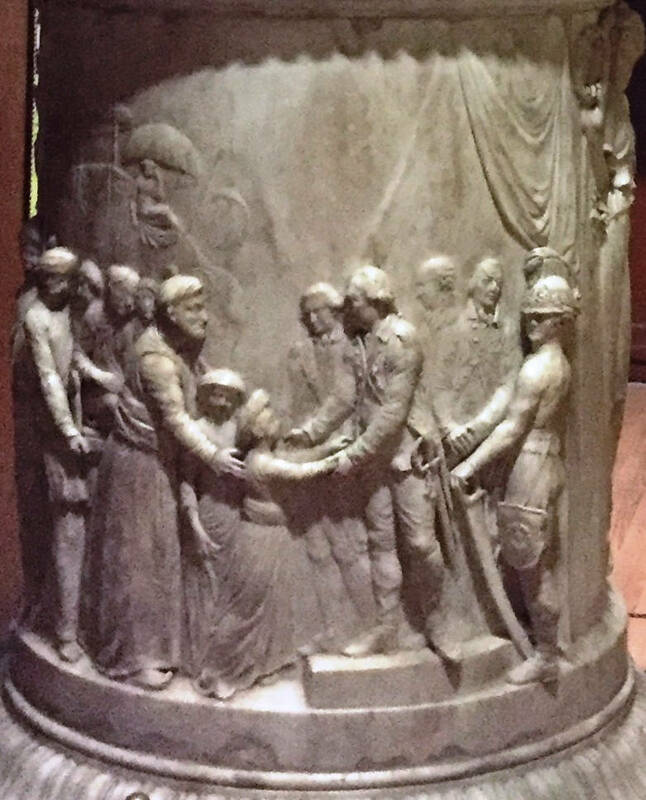 Banks completed the marble portrait statue with its carved pedestal base narrating the transfer of the sons of Tipu Sultan to Cornwallis as hostages for a fee of 33 million rupees. The statue was unveiled on the parade ground of Fort St George on 15th May 1800. 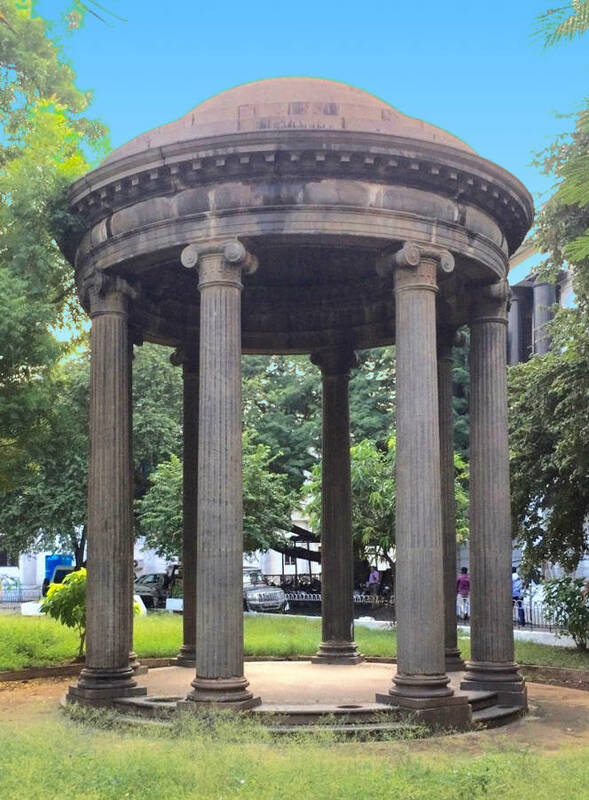 In 1825, fearing environmental damage, the statue was transferred to a newly erected ionic cupola in front of the Secretariat. After Independence the marble figure was moved to the reading room of the Connemara Library before being transferred to the Fort Museum in 1948. Banks spent seven years from 1793 working on a statue of Marquess Cornwallis commissioned by the citizens of Madras to celebrate the end of the Mysore wars. 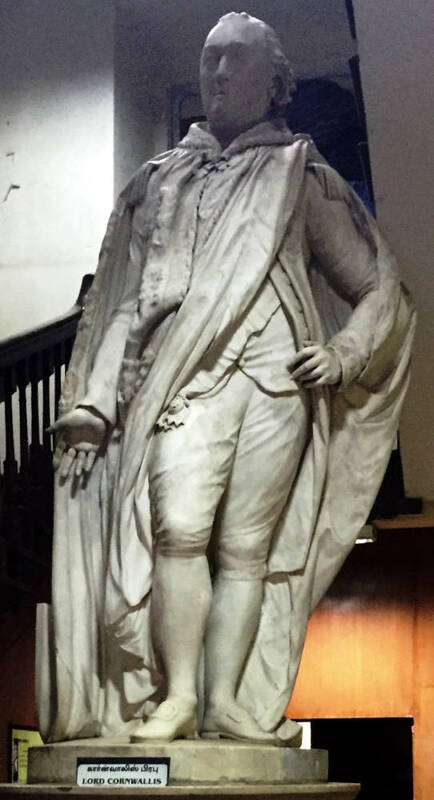 The statue was the subject of a long and earnest debate amongst Academicians on the decorum of presenting Cornwallis in contemporary dress instead of the classical alternative. The work’s emotional force comes from the relief on the base, illustrating the poignant moment when Tipu Sultan had been forced to surrender two sons to British protection until conditions for restitution were met. This metonym for the nurturing of an undeveloped nation by the paternal British Empire is typical of Banks’s major works of this period, for he focusses on moments of heightened emotion, often depicting the grief of a divided family. Roscoe, Ingrid et al. A Biographical Dictionary of Sculptors in Britain. 1660-1851. New Haven: Yale University Press, 2009. Steggles, Mary Ann. Statues of the Raj. London; BACSA, 2000. Photographs and text by the author. You may use this image without prior permission for any scholarly or educational purpose as long as you (1) credit the photographer and (2) link your document to this URL in a web document or cite the Victorian Web in a print one. — George P. Landow.